The term, faith based, can be very broad. But at the heart of what the church is lies the concept of faith. You are a believing people. And that faith is focused, as Paul says in Romans 10:8–13, in the person of Jesus Christ. The word of faith is near you. There is no excuse for unbelief. As Paul in Romans 10 wrestles with the way that many of his fellow Israelites had rejected Jesus as the Messiah, he grieves over the way that they have replaced the righteousness that God provides with a man-made efforts at righteousness. He takes his hearers and us back to Deuteronomy 30 to show that God has been consistent in dealing with his people by calling them to trust him. Don’t ask, “Who will ascend into heaven?” Paul again makes his point with a quote from Deuteronomy 30:12. Moses was making the point that Israel did not need to build their way up to God in heaven (such as the tower of Babel) because God had come down to be with his people. In Paul’s day there were those who would excuse their lack of faith in Christ by denying the incarnation. They believed that for contact to take place between God and man, you would somehow have to climb up to heaven—ignoring the fact that God has already bridged that distance by becoming man in the person of Christ. Behind much modern theology is the notion that a barrier of unknowability separates earth from heaven, man from God. Or there is at least an implicit request for additional revelation beyond the Word. Don’t ask, “Who will descend into the deep?” The original source of the quote (Deuteronomy30:13) refers to crossing the sea. What is the prior reference in the books of Moses to crossing the sea? The Exodus, which is both a display of the justice and judgment of God, and the deliverance he provides his people. Paul changes sea to the deep or the abyss, a reference to the realm of the dead. He is dealing with attacks on the resurrection of Christ, that most basic of beliefs. Paul recognizes that Moses writes with an eye not only to what God had done, but what he would do when the Messiah came. Faith is essential both for the church and for her members. As people who believe the Bible we correctly recognize that neither externals nor our own efforts can make things right between us and God. It is appropriate to call people to personal trust in Christ. Yet in this context, Paul is also concerned with the church as a corporate body. Is it composed only of those who trace their ancestry to Abraham, of can Gentiles who trust in Christ be included—without first becoming Jews? It is not either/or, but both and. The church is made up of individuals who believe, but it is also a believing body. The just live by faith. Habakkuk wrestles with the problem of God seeming to tolerate the sinful rebellion of his people, but the answer that God will bring the Babylonians raises even more questions for the prophet. In Habakkuk 2 the Lord is responding to his prophet. Judgment will come on the wicked Babylonians, whom the Lord is using to punish his people. But even in this, there will be a righteous remnant. And they will live by faith. Paul quotes the prophet as he sets out the theme of his letter, Romans 1:16–17. Faith is not simply a one-time act—it is a continuing trust in God. And for both the prophet and the apostle it is a way of life. “Far from being an incidental statement in Habakkuk, this passage declares the profound truth of the believer’s new mode of life in Christ. He or she lives by faith. . . . Jesus Christ is the object of saving faith, for he has been faithful to establish a new covenant in his own blood, having died for the sins of his people and having been raised for their salvation.” (Camden Bucey, Lamentations, Habakkuk, and Zephaniah, p. 55). Faith is receiving and resting on Jesus. Confess and believe. Paul uses an unusual expression to introduce these quotes: “The righteousness of faith says….” Righteousness is personified. The effect is similar to “Scripture says….” Paul is telling you that God’s revelation is accessible. God’s Word is near you, in your mouth and in your heart. In Deuteonomy 30:14 Moses may have been thinking of the song which God would have him teach Israel so that they would know God’s revelation. God’s revelation is present today. God’s Word is there in written form and it is widely proclaimed. The lack of response cannot be laid to its unavailability (anymore than a self-blinded man arguing that the sun gives insufficient light). God’s revelation is present, and it demands your response. That revelation is even present in your heart and mouth. Your conscience bears witness. Are there excuses that stand between you and confessing Jesus Christ? Are you unsure about the truth of the good news? Ask yourself if the problem lies with what God has revealed, or with your doubting. God’s revelation tells you that Christ has come, has died, and has been raised. His righteousness leaves no room for self-righteous efforts. You are without excuse before God! Belief in your heart will express itself in words. Confess! Confession is more than admitting legal guilt, more, even, than asking forgiveness. It is admitting that you believe in something. What you confess is true. The gospel is simple enough for a child to understand (you don’t need a Ph.D to be saved), but is also complex, because God is the infinite God. Your confession is that Jesus Christ is Lord. As Lord translates the Hebrew JHWH it involves confessing the deity of Christ. Trust Jesus as your resurrected Lord. Your basic confession of faith in Christ also involves submitting to his Lordship. This is not an option or a second step in the Christian life. It includes submitting to him in every area of your life—including dealing with those secret sins that you would just as soon no one knew about. Believe! You must believe certain things—the things God has revealed. Faith involves trust, commitment to Christ. Believe in the resurrection, the absolutely crucial event in the history of redemption. 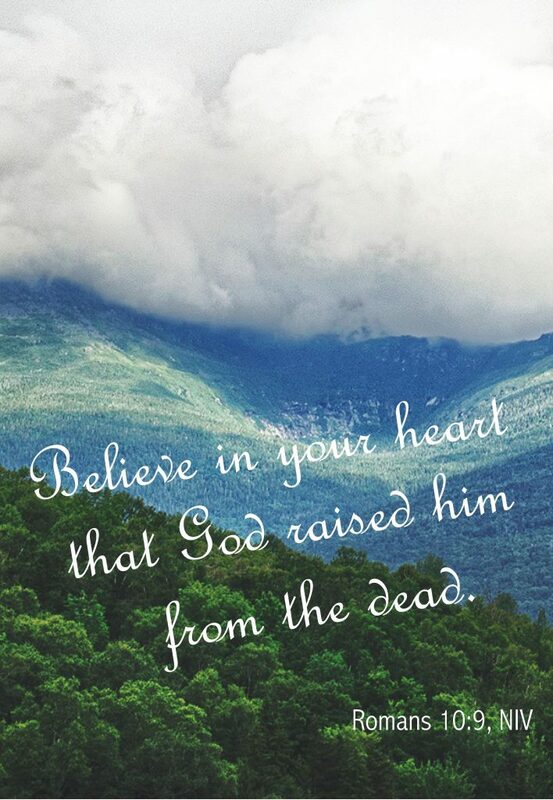 Because God raised him from the dead, he is Lord, Acts 2:36. Christ’s lordship flows out of his finished work. Notice the balance of the Westminster Confession of Faith, 14.2. Faith does many different things. It is active. But at its heart it involves receiving and resting upon Christ. That is Paul’s prayer and plea for his fellow countrymen. “No matter how it is said, the point is that faith does not simply look to promises. Nor does faith look to the blessings that Christ brings to Christians, such as the forgiveness of sins or the gift of righteousness. No, faith looks to Jesus Christ himself.” (Chad Van Dixhoorn, Confessing the Faith, p. 191). You will be saved. As your trust is in the Savior who rose, you are raised with him. He is the firstfruits of your resurrection. Christ’s lordship is the guarantee that nothing is strong enough to separate you from God’s love in Christ. Your salvation is both a present reality and a future hope. It is a life lived in fellowship with your Lord and his people today–while you look forward to the fullness of his work completed at his second coming. The church is a confessing community, believers and their children. It is not that the act of confessing itself saves, but it is acknowledging a trust in, a dependence on the Savior who is far more reliable than any efforts at self-righteousness. If your hope of salvation rests on who you are or what you do, no wonder you look around for excuses! But Paul tears those excuses away one by one. He points you to the Lord Jesus Christ. He invites you, he commands you, to trust in him and confess him as your Lord.